It is that time of year. This week I finished marking a pile of essays and have to give a final exam on Friday. And I’m in the midst of a very fun and interesting interdisciplinary conference, Thinking Mountains, all about international mountain studies. I’m enjoying it because it has a great mix of things in my field (environmental history) and things entirely outside of my field, but which are united by a focus on particular kinds of places (mountains) and consideration of our (human) interactions with them. 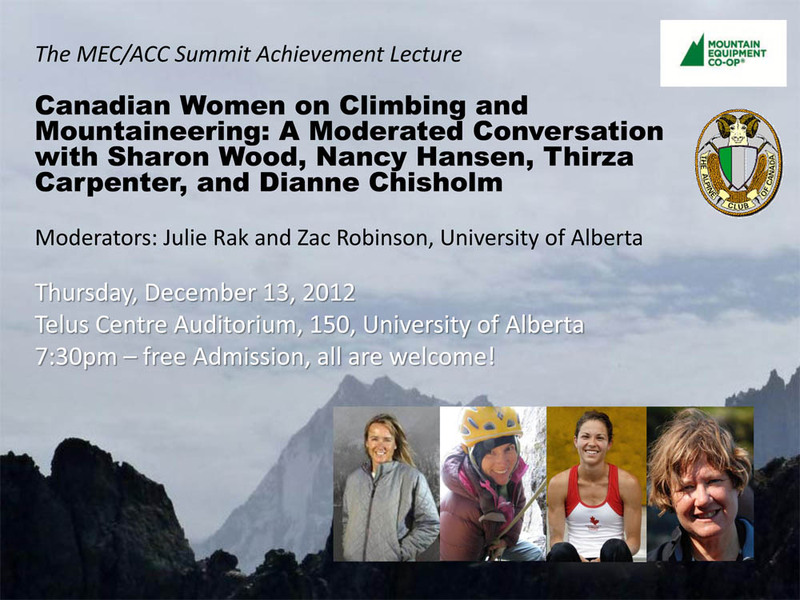 So in lieu of a proper post I wanted to plug tonight’s plenary — a roundtable conversation on Canadian women and mountaineering, which features four of the most accomplished Canadian women mountaineers and climbers, who work and play in a hyper-masculine environment. If you’re in Edmonton you should come out to it, it’s open to the public. If not, they’ll be recording the roundtable so you can check it out online in the future via the U of A’s mountains studies website. Next Post We love you. Take a rest!